EHE is the workhorse of the E Series metering pumps. Superior mechanical design and quality of manufacturing merge to create a pump greater than the sum of its parts. 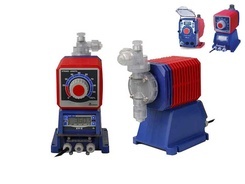 EHE pumps have outputs up to 20 GPH (76 l/h) and a maximum pressure of 150 PSI (10 bar). Combining the EHE performance with a turndown ratio of 1800:1 yields one of the most versatile pumps on the market today. EHE Series is ideal for chemical feed applications in a wide range of fields, including drinking water, agriculture, and municipal/industrial wastewater.